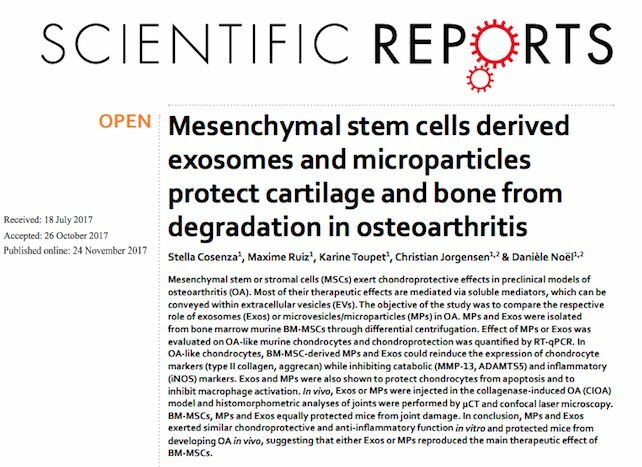 ‘Mesenchymal stem cells derived exosomes and microparticles protect cartilage and bone from degradation in osteoarthritis’ by authors: Stella Cosenza, Maxime Ruiz, Karine Toupet, Christian Jorgensen & Danièle Noël was published online on 24 November 2017 in the open access Nature publication Scientific Reports. Abstract: Mesenchymal stem or stromal cells (MSCs) exert chondroprotective effects in preclinical models of osteoarthritis (OA). Most of their therapeutic effects are mediated via soluble mediators, which can be conveyed within extracellular vesicles (EVs). The objective of the study was to compare the respective role of exosomes (Exos) or microvesicles/microparticles (MPs) in OA. MPs and Exos were isolated from bone marrow murine BM-MSCs through differential centrifugation. Effect of MPs or Exos was evaluated on OA-like murine chondrocytes and chondroprotection was quantified by RT-qPCR. In OA-like chondrocytes, BM-MSC-derived MPs and Exos could reinduce the expression of chondrocyte markers (type II collagen, aggrecan) while inhibiting catabolic (MMP-13, ADAMTS5) and inflammatory (iNOS) markers. Exos and MPs were also shown to protect chondrocytes from apoptosis and to inhibit macrophage activation. In vivo, Exos or MPs were injected in the collagenase-induced OA (CIOA) model and histomorphometric analyses of joints were performed by µCT and confocal laser microscopy. BM-MSCs, MPs and Exos equally protected mice from joint damage. In conclusion, MPs and Exos exerted similar chondroprotective and anti-inflammatory function in vitro and protected mice from developing OA in vivo, suggesting that either Exos or MPs reproduced the main therapeutic effect of BM-MSCs. Read more about the role of Centre Hospitalier Universitaire Montpellier in ADIPOA2 here. 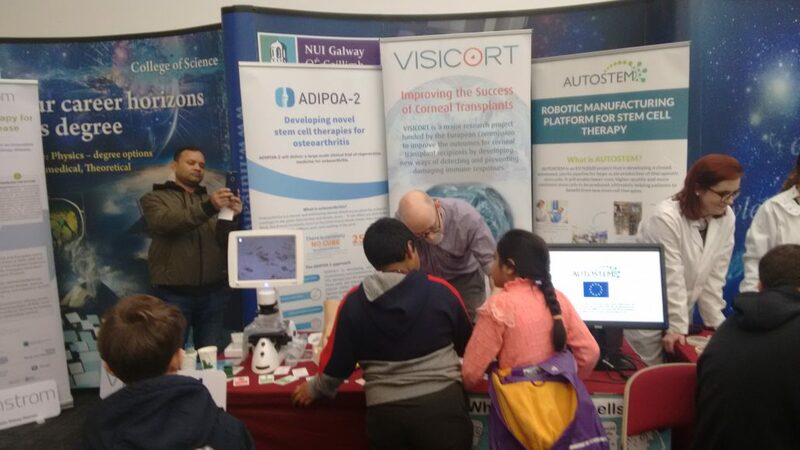 ADIPOA-2 researchers at NUI Galway exhibited at the Galway Science and Technology Forum on 26 November 2017. In excess of 20,000 people attended the exhibition day. The NUI Galway regenerative medicine stand was the brainchild of Dr Siobhán Gaughan who works across several EU-funded stem cell projects coordinated at NUI Galway. Researchers Georgina Shaw, Amy Burke and Eka Mukeria, along with Siobhán Gaughan were on hand to explain the cell research ongoing at the university, the objectives and mission of ADIPOA-2, and to inspire the next generation of stem cell scientists. Several activities were on exhibition. Dr Siobhán Gaughan, NUI Galway Programmme Manager of ADIPOA-2, VISICORT and AUTOSTEM was on hand at the awards ceremony for a schools’ competition called “START” whose aim was to encourage school students to come up with interesting questions and to design and run trials to answer them in a scientific way. 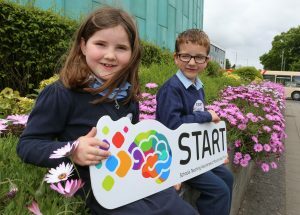 “It is one of the only initiatives out there that is teaching children about randomised trials,” says Dr Sandra Galvin, who co-ordinates the Health Research Board Trials Methodology Research Network, which runs the START initiative. “We need more people to participate in trials to improve healthcare, so there is that big important picture here, and it comes down to kids having fun and they take the message home.” For more information about taking part, see hrb-tmrn.ie/start-competition. 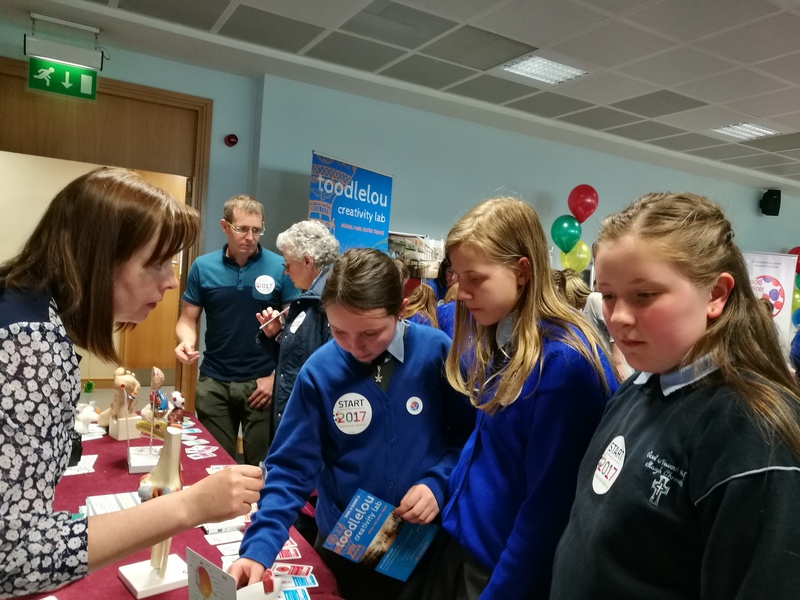 Siobhán created and managed a presentation area for the three projects, spoke to the school groups and visitors who were interested in the planned clinical trials for ADIPOA-2 and VISICORT taking place at NUI Galway’s Clinical Research Facility. A sister project, AUTOSTEM was also represented. This project is looking ahead of the clinical trials in order to meet the needs of the clinics in the future by developing automated cell factories to produce the vast quantities of cells which will be required should the clinical trials prove successful. Hosted by Leiden University Medical Center, the EU MSC2 2017 meeting in Leiden, NL on September 12th and 13th will assemble twelve EU-funded, mesenchymal stromal cell-focussed consortia. Projects to be presented include: REDDSTAR, REACH, Nephstrom, SCIENCE, VISICORT and Adipoa-2, AUTOSTEM, BOOSTB4, SEPCELL, RESSTORE, RETHRIM, Stellar, MERLIN, and RESPINE. This two day, interactive meeting will be held at the Stadsgehoorzaal Leiden. Three overarching aspects of the EU-MSC2 meeting include: mechanisms of action and potency assays; an interactive panel discussion on product development, and product development and market authorisation in a changing regulatory landscape. ADIPOA2 partners Evangelisches Waldkrankenhaus Spandau today announced the enrollment of the first patients in the German arm of the ADIPOA2 trial. The ADIPOA2 has successfully secured regulatory approval for the Italian part of its clinical trial. Click here and here to see some of the coverage of this exciting news in the Italian media. ADIPOA2’s Italian partners, Instituto Ortopedico Rizzoli de Bologna, announce the launch of the Italian arm of the ADIPOA2 trial. Click here for a copy of IOR’s press release. 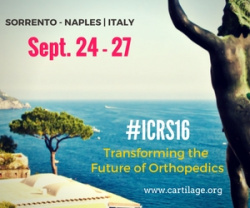 ADIPOA2 researchers Prof. Frank Barry and Dr Mary Murphy (NUIG) attended the 13th World Congress of the International Cartilage Repair Society in Sorrento, Italy, on 24th – 27th September. The work of the ADIPOA2 project was highlighted during the conference sessions. ADIPOA2 was one of a number of projects discussed at the A FACTT meeting in Galway this week. 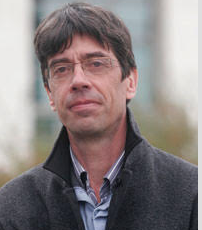 A FACTT is an Action to Focus and Accelerate Cell-based Tolerance-Inducing Therapies, funded through the COST (European Cooperation in Science and Technology) Programme. 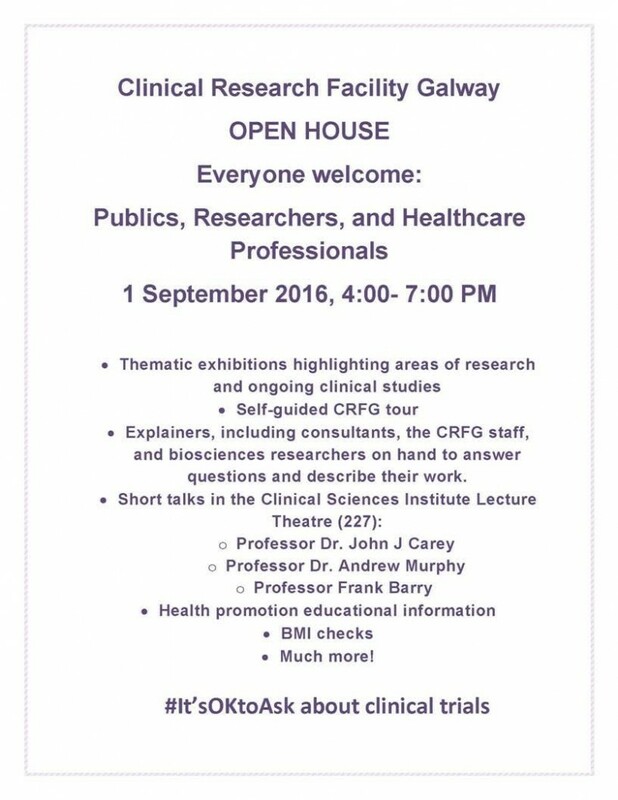 The meeting is being hosted by NUIG and runs from 5-7 October.